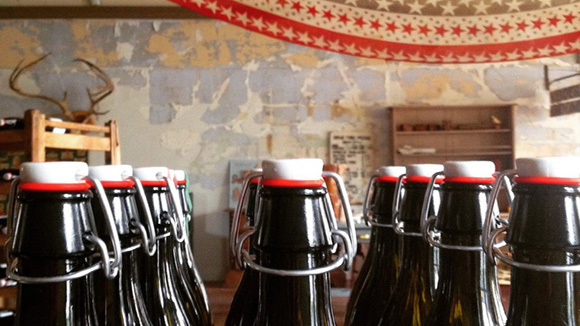 Wayside Cider is now available by the bottle at a new tasting room in Andes. Photo via Facebook. Wayside Cider, Delhi’s newest cidery, christened its Andes tasting room Saturday night. A collaboration with Kabinett & Kammer, the new spot is called The Annex. In addition to featuring Wayside’s delicious apple-based drinks in bottles and K&K’s curiosities, it’s also part farmers’ market, offering goodies from Phoenicia Honey Co. and Star Route Farm. Sad news out of Arkville: The Watershed Post reports that Arkville’s Lazy Crazy Acres will cease production of its locally sourced gelato after five years. Glad news out of Arkville: Beloved pizza joint Oakley’s is expanding its kitchen capacity, with the addition of a second wood-fired oven, just delivered from Los Angeles. Stay tuned for new entrees, including seafood specials, says owner Gerard Debari. And North offers an illustrated guide to some great summer picnic spots. Sap Bush Hollow Farm’s Shannon Hayes announces plans to open a farm store and cafe in West Fulton. Thanks for the update, Karen! Cool, wIll have to check out that pizza night. Glad someone’s finally created a place like this online to hear about this kind of cool stuff!